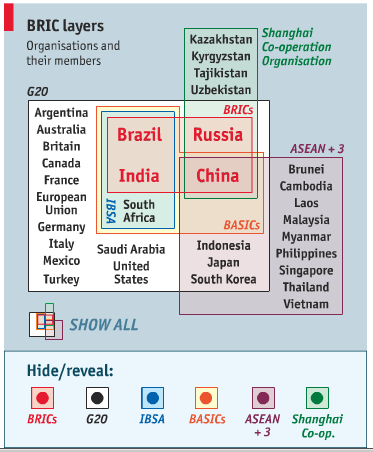 In an excellent piece with a very useful graphic, The Economist contrasts and compares the BRICs according to several categories, pointing out that the four countries are far from homogenous. 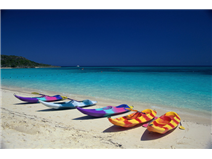 “The BRICs have also stepped up competition between one another in third countries. Although the flow of aid and investment from rich countries to poor has been faltering, China promised $10 billion of cheap credit to Africa in 2009-12 and Brazil has invested $10 billion in the continent since 2003. The BRICs have also dramatically increased their purchases of exports from poor countries. Rather as America and the Soviet Union vied for influence through economic and military aid, the BRICs do now (though their competition is less fierce than the cold-war version). Even where BRIC countries agree in general, they often disagree in detail. Climate change is a good example. The emerging giants all argue that Western industrialised nations should take the largest share of the burden of cutting greenhouse-gas emissions. They criticise absolute emission caps for developing countries and argue for limits based on population or intensity of use. They all want to keep questions of trade and climate change separate, opposing things like carbon duties. However, for the purposes of climate change, the BRICs are actually BASICs (Brazil, South Africa, India, China): Russia is an industrialised country under the Kyoto accords, with obligations the others do not have. Even on a specific matter such as forestry, their records differ. Brazil is the world’s biggest deforester, albeit one committed to slowing the pace; China is the world’s biggest afforester (now planting 4m hectares of forest a year)—though some complain that its trading partners’ trees are being felled to stoke its economic growth. Lastly, the BRICs differ economically. Obviously, their incomes range widely, from Russia’s $15,000 per head per year to India’s $3,000 (these are IMF figures using purchasing-power parities). Brazil and India define themselves as non-aligned developing economies. Russia does not. China sometimes does, and sometimes thinks of itself as sui generis. China and Russia have more open economies, with exports accounting for around a third of GDP. India and Brazil are more closed, with exports less than a fifth of GDP. Perhaps most important, China and Russia are both running huge current-accountsurpluses; Brazil and India, small current-account deficits. That reflects fundamentally different approaches to economic management. China is suppressing domestic demand and encouraging jobs in export industries. India and Brazil look askance at this form of mercantilism and suffer from China’s resulting currency undervaluation.” This is part of my survey of the 30 best articles from The Economist over the past two years to gain insight into whether Brazilian attitudes towards America have declined, and global attitudes towards Brazil — comments welcome! This entry was posted in Article review, Brazil, Investment, Politics and tagged Brazil, BRIC, BRICs, China, India, Russia. Bookmark the permalink.